The Chinese economy is still growing far faster than the United States. These American companies are hoping to seize that opportunity to boost their bottom lines. iPhone fever is finally touching down in China. The country has roughly 1 billion mobile phone subscribers -- the most in the world. It was no surprise then, when in February Apple CEO Tim Cook told investors, "We've been very, very focused on China." Apple's sales in the country have more than quadrupled over the last year alone, totaling $12 billion in 2011. While U.S. customers still account for more than a third of the company's worldwide sales, China is inching up and now makes up about 12% of Apple's total revenue. 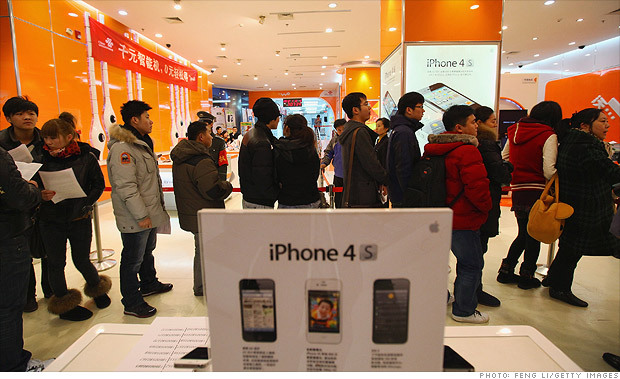 Earlier this year when Apple launched the iPhone 4S, the company had to shut down its Beijing and Shanghai stores as scuffles broke out among hundreds of devout fans waiting in line. That's a far cry from 2009, when Apple's launch of the first iPhone in China was generally regarded as a disappointment.